I’ve searched around and asked people I trust to help me put together a list of all the stuff I need for motorcycle touring camping gear. I’ve accepted some advice, rejected some advice, and included the gear with which I’m familiar to come up with this list. This list is here for your review, amusement, and quite probably some judgement. This stuff works for me but might not work for you. I’ve categorized the gear mainly by how I use it but also by how I pack it. The right gear packed the right way will make your trip much more fun and comfortable. And this is a process. If you’re at all like me, and the fact that you’re reading this page probably means you’re at least something like me, you’ll be changing your gear after just about every trip. I attended a seminar at the 2015 MOA rally entitled “Touring Tips & Tricks” presented by Tom Mehren. 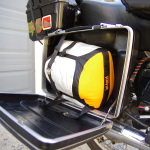 Tom is the author of “Packing Light, Packing Right – The Sound Rider Guide to Motorcycle Packing” and is very well respected in the motorcycle touring community. He provided a lot of good information in his seminar but the key point was to plan on hauling between 70 – 100 liters of stuff when touring. I far exceeded that goal not because of the number of items I hauled but rather the size of the items. So, my personal goal has been to downsize my gear while still being comfortable. 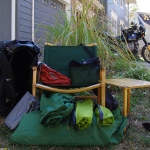 This list represents my current collection of camping gear for motorcycle tent camping. I have a new perspective on tent living after two rallies and about 2,500 miles of motorcycle touring. Your tent needs to be easy to set up and take down. And you must be able to keep it separated from the rest of your gear when it gets wet. Even if it doesn’t rain your tent will get damp on the bottom and, depending on the dew point, will end up with a damp rainfly. tent – My favorite tent is the Eureka Timberline 4 person tent. I like the 4 person model because I can put myself and my stuff inside to keep it out of the weather. 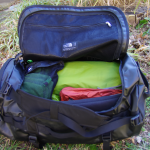 It is easy to set up, packs small enough to fit in my preferred duffel, but does weigh in at almost 8 pounds so it is a bit heavy. The Timberline is a “classic” tent and there are definitely lighter and more innovative tents available but remember, I ride a 1977 airhead and a 2003 oilhead so being on the cutting edge of technology isn’t my super power. I love this tent, but the love is more about nostalgia than comfort. A spring camping trip reminded me how limiting this tent is – especially when its raining. I spend several uncomfortable hours in this tent during a spring downpour. I’m not claustrophobic at all but not being able to stand up for several soggy hours was no fun. I have a new tent I’ll be trying soon so watch for an update here. tent vestibule – I think camping is fun but when things get wet it isn’t as much fun, and when the inside of the tent gets wet and dirty, camping is even less fun. To address wet and dirty gear I decided to add a vestibule to my rig. This add-on allows me to leave my damp and/or dirty gear under cover but not inside my tent. This adds another 14 square feet of cover for my stuff and only adds just a bit over a pound to my pack. Not a bad trade in my opinion! I’ve retired the vestibule due to the fact that it really wasn’t providing enough additional storage space to really matter. It didn’t weigh enough to matter but if I’m not going to use it I’m not going to pack it. ground cover/floor saver – I use a floor saver to extend the life of the tent floor. No matter how meticulous you try to be there will still be stuff on the ground that can tear your tent floor. Spend the extra money to extend the overall life of the tent. You can also use an inexpensive tarp under your tent – you don’t have to get a matched set (tent + floor saver) but having a matched set appeals to me so I bought the Eureka brand product that fits my tent. tent stakes – I list these separately because I couldn’t find mine when I re-packed my gear for the 2015 rally season. I’m calling out the need for tent stakes separately because its a good thing to make sure you have them packed! I bought two of the MSR Ground Hog Stake Kits so I could have extras if needed. They don’t weigh much at all and they can come in handy if the weather gets bad and I need to use the storm rings on the rain fly. tent peg mallet – Get the plastic tent peg mallet / puller from and call it good. I didn’t – I lugged along a camp hatchet that didn’t add anything other than weight to my kit. That hatchet is now in my pickup truck tool box. (updated) dry sacks – I recently switched to Sea to Summit eVent Compression Dry Sacks for the bulk of my gear. I went with XL size because even if I don’t need all that room I can roll the bag down to fit the gear. The neat thing about these bags is that, even though they’re water resistant the extra air will vent out when packing. I primarily use two of these bags; one for my sleeping gear and one for the tent. I use a small REI dry sack for the tent footprint to keep the dirt and moisture the footprint invariably picks up away from the tent proper. chair – The Kermit Chair in Forest Green. I tried one of the ultralight chairs that are all the rage but they weren’t stable for me (which means I ended up on the ground before I had a beer or two). I also tried a different ultralight chair with a wider base but it sits so low standing up was a challenge. 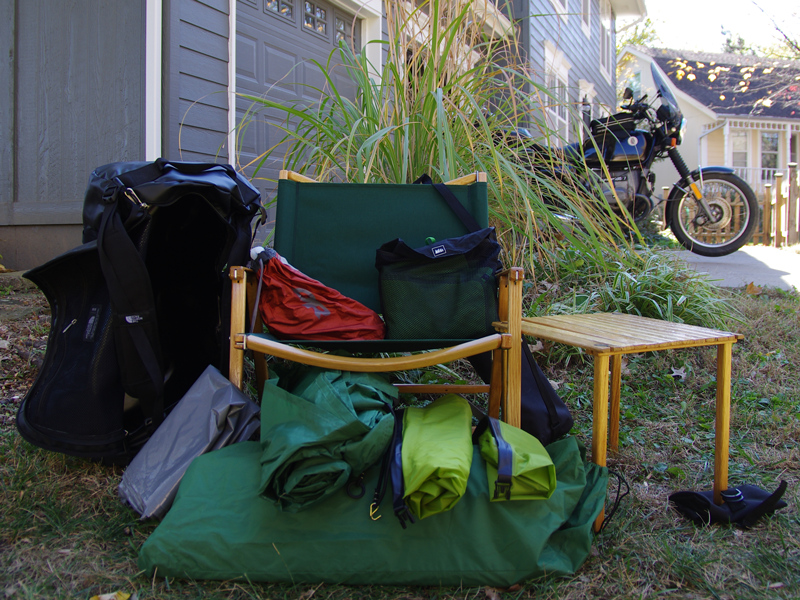 The Kermit chair is just fine and is more in keeping with my classic tent (and motorcycles). table – The Kermit Table. I like to be able to place my coffee pot and coffee cup on a table rather than on the ground. It’s also nice to be able to have a light up off the ground when needed. camp towel – REI MultiTowel. Even though you’ll be in the wind, you’ll still get hot, sweaty, and smelly so you’ll want to take a shower whenever you get the chance. Be sure and pack a good camp towel because they are designed to be absorbent and dry quickly. For long camp weekends consider adding a second towel. 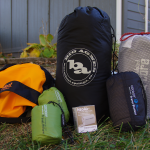 lantern – I keep one Black Diamond Voyageur Lantern in the duffle bag. This lantern is primarily used on the camp table but I keep it in the duffel in case I need a strong light due to a late arrival. interior tent lighting – I use two MoonLit LED Micro Lanterns for interior tent lighting. These neat little lights swivel and can I hang them from various interior hooks, loops, etc. so I can have interior tent lighting. The best test – they provide me with enough light to find my glasses at night! exterior tent lighting – I have a handful of Nite Ize SpotLits I can attach to my tent’s guylines. This is something I’m toying with based on my recent test camp session as my last camping location was extremely dark. It is difficult, if not impossible, to see the tent’s guy lines when it is really dark. Also one of these, in orange and attached to the entrance of your tent can help you find your way home among a sea of other tents. Trust me, this has nothing to do with drinking beer around the campfire. 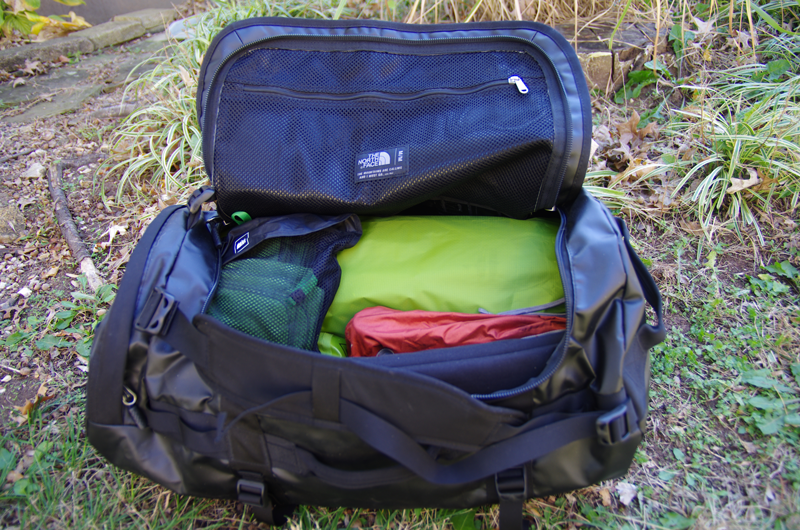 This collection of gear goes in a medium North Face Base Camp Duffel. 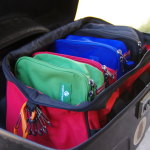 The duffel is waterproof and gets strapped to the passenger seat using a pair of ROK straps adjustable straps. Find the system that keeps you warm in the fall, cool in the summer, packs small, and allows you to sleep comfortably. I took advice from my riding buddy and upgraded my sleeping system to the gear shown below. This is a where an REI membership can pay off. If you order it and it doesn’t work for you, return it and try something else. If you can’t sleep, your trip will be awful so take this seriously. other pillows – Therm-a-Rest Compressible Pillow – I have a pair of these I’ve kept in the Jeep during my broken arm recovery and it was nice having another pair of pillows the last time I camped. The Therm-a-Rest pillows don’t pack as small and aren’t as light as the Cocoons. Both are good options but the Cocoons are the space savers of the two. 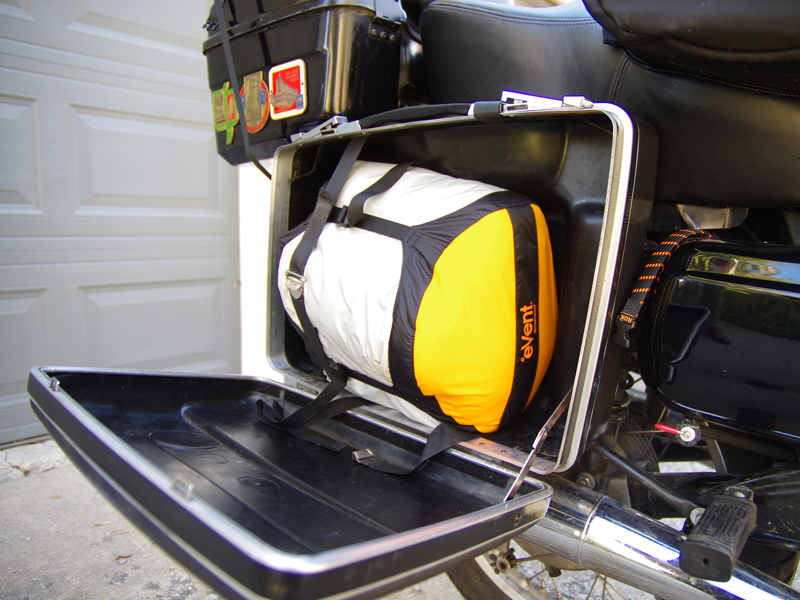 Gather up all your sleep system bits and find a compression sack that holds it all AND fits in a pannier. I chose an Extra Large Sea to Summit eVent Compression Dry Sacks. This sack allows me to compress all the gear down, vent the air out as I close and compress the sack, and it also keeps things dry. Be sure and know what tools you need for common maintenance and repairs when you’re on the road. My riding buddy asked me what should have been a very simple question – “can you recover from a flat tire?” I didn’t have a good answer so I asked for advice. That advice was acted upon as shown in the list below. motorcycle toolkit – BMW provided a very good toolkit with my airhead and the majority of the tools are still present. I’ve added a couple of things here and there but my stock toolkit is great. If you run wheels that require tubes, make sure your toolkit includes tire irons! multi-tool – You’ll need this at some point so get something versatile and light. I’m going to go out on a limb here by assuming this is a piece of gear you probably already have. If not, my current mult-itool is the Leatherman OHT. knife sharpener – Knives get dull with use so keep a small sharpener in the tool bag. I use a Lansky PS-MED01 BladeMedic. mechanic’s gloves – Don’t use your riding gloves if you have to work on your motorcycle. You can get mechanic’s gloves lots of places. I happened to be at Sears the last time I thought about buying gloves so I picked up a pair there. Nothing magical about them but like I said, don’t use your riding gloves when making repairs. shop rags – nothing special here either – just pick up a package at the hardware store and keep them with your tools so you have a way to wipe road grime off the bike, gunk off your hands, etc. air compressor – I wired my bike for a Battery Tender so I have what’s known as an SAE plug hanging off the battery. Get a small air compressor that will run from a cigarette lighter power port along with an SAE to cigarette lighter socket and you’ll be set. I carry the Slime Tire Inflator. Whatever you select make sure it can inflate your motorcycle’s tires to the recommended pressure once you’ve made your repairs. patch/plug kit – If your bike’s tire system requires tubes, make sure you have a patch kit to repair the tube and the tools necessary to remove the wheel and tire on the side of the road. If you or your touring companions ride tubeless tires, be a pal and pick up a plug kit as well. 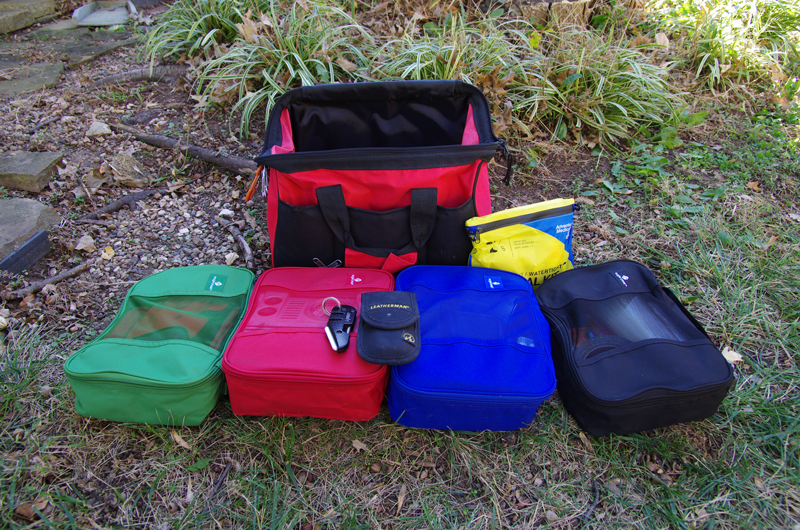 You can pick up patch kits and plug kits when you pick up the portable air compressor. batteries – When camping you will run out of battery power at the worst possible time – like when you’re setting up camp in the dark after riding all day. Keep spare batteries with you and, if you can, standardize on one battery size. 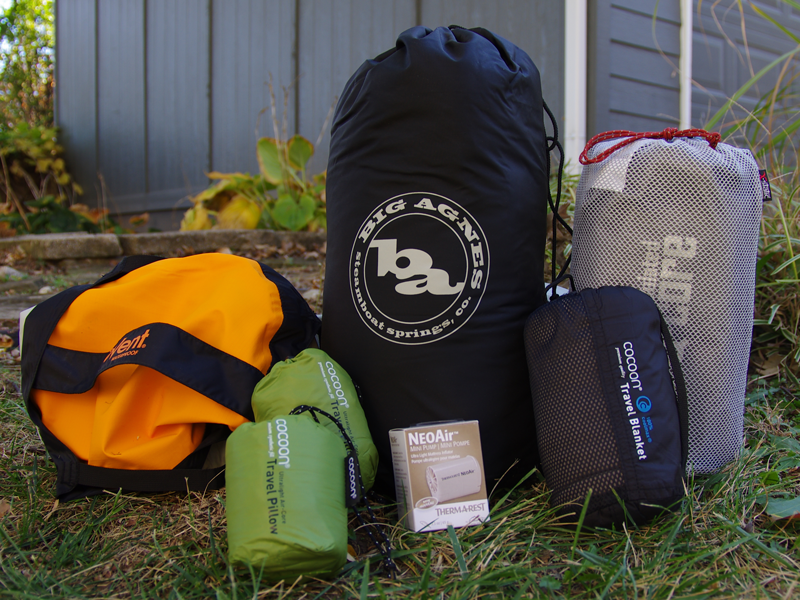 I was really, really close to standardizing on AA until I bought my air mattress inflator. Now I carry spare AA and AAA batteries. duct tape – It does everything – even temporarily patches a cracked rocker cover! super glue – It glues most things. Its just a good idea to have a tube or two with you. paracord – I don’t know anyone who has actually taken apart one of those paracord bracelets in a survival situation but I do know that paracord is strong and handy. Also check your tent’s setup instructions for a diagram of how to set up your tent in high wind conditions. The extra paracord will come in handy in this situation. You can also use it to set up a clothesline for drying out your camp towel. zip ties – Almost as versatile as duct tape and always in demand. 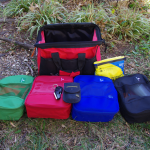 first aid kit – There are far too many first aid kits out there to figure out what’s best but throw one in your bag. Cut fingers bleed and you’ll want to stop the bleeding. 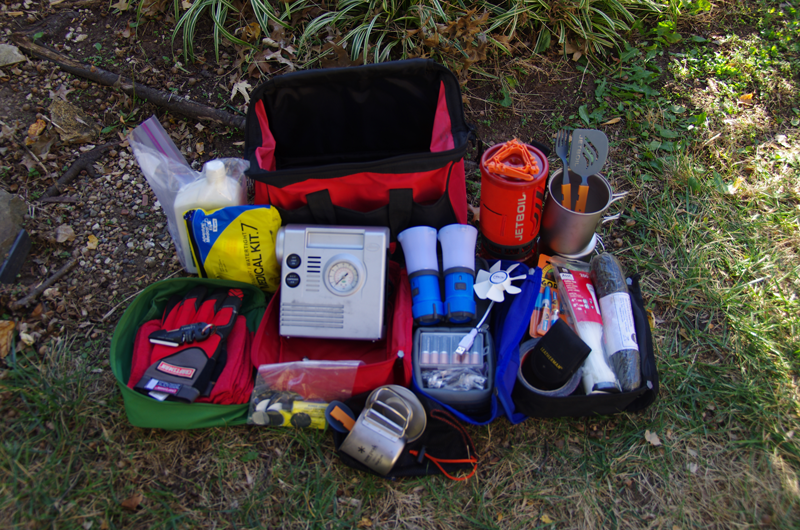 I got the Adventure Medical Kit Ultralight.7. motor oil – Take along a quart and don’t forget a small funnel! Better to have a quart of oil and not need it than need a quart of oil and not have it. stove + fuel – My personal preference is the Jetboil Flash Cooking System. Because of my addiction to coffee I also have a standard coffee press kit for the Jetboil. Jetboil fuel is readily available and the Jetboil stove is popular among motorcycle campers so you can probably beg some fuel from a fellow motorcyclist/coffee addict if you run out. FYI – a small fuel container fits inside the Jetboil. coffee cup – I use a Snow Peak Titanium Single-Wall Cup. I got the small one so it will fit inside my cook set but pick the size you like best. silipint – I picked up an MOA-logoed silipint at the 2015 Billings, MT rally and just love this cup. It is unbreakable and, with dogs and cats in the house, having an unbreakable cup is pretty handy! This packs easily and seems pretty much indestructible. sili wine glasses – In addition to being a coffee junkie I’m also an accomplished wino so I also have a pair of sili wine glasses. wine transportation – This item deserves a special call out. The VinniBag had its maiden voyage on my March 31 trip. While that trip was interrupted by a season-ending accident, the bottle of wine in the VinnieBag survived! This begs the question, do I really need to carry a bottle of wine with me when I’m headed to a rally? Probably not as there are likely lots of liquor stores along the way but this was a problem I wanted to solve even if the rest of the world didn’t think it needed solving. 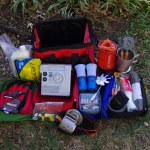 cook set – I carry the Snow Peak Titanium Mini Solo Combo. The set weighs in a 5.5 ounces so weight isn’t an issue but if space is, and food is readily available where you’re going, you can leave this behind. dinnerware – I added dinnerware to my gear for a recent long weekend event. I chose the Sea to Summit Delta Camp Set in orange (of course). This set includes a plate, bowl, cup, and utensils. This turned out to be a good call as the food vendors used the smallest possible packaging to reduce the amount of trash. Having a plate and bowl to which I could transfer my food made meal time much more enjoyable! lantern – I keep one Black Diamond Voyageur Lantern in the top case. While there are stop light kits for my Givi top case there isn’t an interior light kit so I use a second Black Diamong lantern. This latern has a handy hook that allows me to hang it from the edge of the top case. It also has the option to shine the light down like a flashlight. The tools & stuff go in one of two places – the toolkit provided with the motorcycle goes in the tool box under the seat. This is the place it’s supposed to be so I logically put it there! The rest of this gear gets organized in a tool tote that rides in the top case. There’s nothing magical about the tote – it originally was a basic car survival kit – crappy jumper cables, largely useless emergency blanket, road flares (I think the kids used them for something other than their intended use but I’ll likely never get the real story on that), etc., but the contents slowly disappeared and all that was left was the tote. It fits nicely in the top case so its new job is keeping these tools from rolling around the top case while I ride. 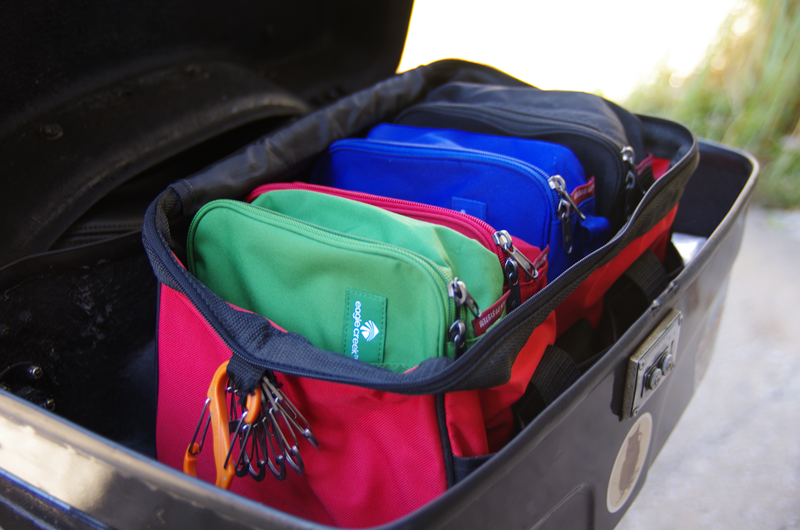 The gear gets organized inside the tote using four Eagle Creek Pack-It Cubes (medium). These cubes let me keep things organized as shown in the pictures. Through some odd consequence four cubes fit in the tote with room to spare for the first aid kit. 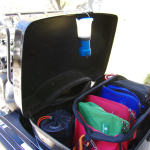 The Jet Boil, the cook set, and the motor oil/funnel fit in the top case around the tote. The sili pint + sili wine glasses also fit nicely in the empty spaces around the tote. As a sad sidebar, the top case pictured above was totaled in my 3/31/2016 accident. The fiberglass failed at the hinges so I suppose I could try to save it but it was much easier to buy a Givi Universal Mounting Plate to allow me to use the Givi Maxia III top case I bought for my oilhead on my airhead as well. The general gear is very much about personal preference. 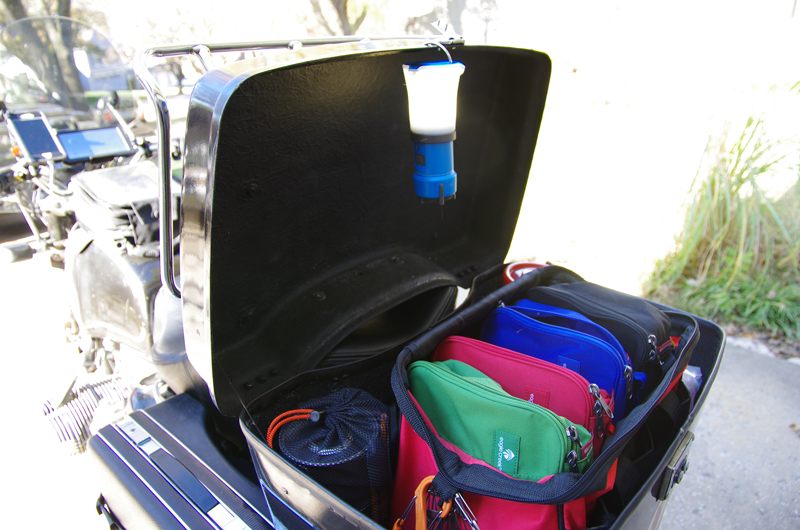 You do not need to take a coffee system to motorcycle rallies. You can generally count on there being a large supply of coffee. It may not be the best coffee in the world but it will be hot, contain caffeine, and be generally available. Read the rally description to make sure you know your coffee options if you’re a junkie like me. As for food, again, the rally description will tell you what to expect. For example, at the Top O’ The Rockies rally, the sponsoring club provided dinner the last night; at the MOA rally, there were food trucks. There’s also the option of going off site for meals. You probably don’t have to bring in food but do what you’re comfortable doing. TP – Roadside rest areas and rallies will provide facilities but sometimes TP can become scarce or if you need to stop urgently by the roadside you’ll be glad to have a couple of rolls of this essential product! A couple of rolls in a one gallon freezer bag fit nicely in the top case and I didn’t think a picture was really necessary. Headlamp – It is really, really important to me to have a headlamp handy and I use my Petzl Myolite 3 a lot. This light is discontinued but the reason I selected it was because it uses AA batteries and I was trying to standardize on AA batteries. When it dies or disappears I’ll move to a AAA model (at which time I’ll be forced to reconsider my camp lanterns as they will become the only AA-powered gear). Water Bottles – You don’t want to run out of water because no water means dehydration and dehydration makes you do stupid stuff. I have two Polar Insulated Bottles. My jacket and coat also support a hydration bladder system so I can stay hydrated while I ride. Cash – If you’re used to using your credit card everywhere around town that’s great but there are still places between cities where cash is king. Take enough cash to get yourself back home if you do something stupid like leave town with an expired credit card. Spare Set of Keys – You will misplace your keys at some point. While you will want to make sure you turn over every stone to find your primary keys, be sure you have a spare so you can continue riding. This also includes anything else you lock. If your bags require a separate key, make sure you have spares for those as well. And if you’re locking your bike along the way, make sure you have a spare key for that lock as well. Clothes – Avoid cotton and instead wear synthetics. Synthetics breathe better, dry faster, and wick sweat away more effectively. Also limit the number of changes of clothes you take and assume you’ll do laundry on the road. The other thing to keep in mind is changing weather conditions. Be able to add and subtract layers when riding and camping. Camp Shoes – Don’t plan on wearing your riding boots everywhere. A pair of sandals like Keens are great when the weather’s warm! I also take my shower shoes just to make sure I can keep my feet off the community shower floor. Hat – Depending on the size of the rally you may be walking a lot. Don’t get sunburned – wear a big brimmed hat. My personal favorite is the Tilley Traditional Hat hat because it wicks away sweat very effectively. It also allows me to display my pin collection! Rain Gear – If you’re not comfortable riding in the rain, pull over and wait it out. If you are comfortable riding in the rain, and if your riding gear isn’t waterproof (or whatever the correct term might be) have a layer you can put on when its raining. While it may not bother you to get wet, when the rain stops you’ll still be wet and you’ll then be riding at speed. You’ll get cold. Don’t get cold! Toiletries – This is again a personal preference but make sure you have the stuff you need. The good campgrounds will have showers but you’ll need to bring soap, shampoo, and all the stuff necessary for you to feel clean. Don’t forget your camp towel (mentioned above). Medications – Make sure you take your prescriptions, vitamins, and anything you take daily. AAA membership + card – My advice – make sure you have your card with you and that you have the right coverage. AAA considers motorcycles Recreational Vehicles so make sure you have RV coverage added to your membership. This is especially helpful when nothing else in your toolkit will make your bike run. Glad you found the list helpful. It is a moving target so stop by every once in a while to see where my allowance went. Hope to see you in SLC as well! Thank you for sharing your list. I was beginning to think I was the only one taking my house with me. I am also going to SLC leaving from Northern Idaho tomorrow morning. Safe travels! You have to be comfortable when you get to your destination! I get criticized for over-packing too but if I’m not comfortable I’ll get cranky and then be criticized for being cranky! Pack wisely but be comfortable!